Two charities are set to benefit from the glowing tenth anniversary of Kielder Winter Wonderland. One of the tallest growing trees within the award-winning Kielder Water & Forest Park, Northumberland, will be lit up for the first time on Friday November 15 2013, to celebrate ten years of the popular outdoor Christmas event. The tree, which is located at Leaplish Waterside Park, is the same height as the Tower of London at nearly 89 feet (27 meters) and will be decorated in 14,000 sparkling starry lights. Visitors to Kielder Winter Wonderland are invited to buy a ‘star’ on the tree to boost funds for Children in Need and North East Promenaders Against Cancer (NEPAC). Sold at £1 donation per star, the charities could receive up to £7,000 each. Peter Pattinson, Guest Services Manager at Northumbrian Water who host the event, said: "Without giving too much away, this year the theme for Winter Wonderland is ‘wish upon a Winter Wonderland star’ where children can capture their Christmas wishes. "In celebration of our tenth anniversary we have an enormous Christmas tree wrapped in twinkling lights and are giving visitors the opportunity to buy a ‘star’ in aid of these two amazing charities." Rosalynde Walker, Founder and Director of NEPAC, said: "We are absolutely delighted that Northumbrian Water have chosen to support us. "Since 1989 we have been raising money for cancer research teams at the Royal Victoria Infirmary, Newcastle, as well as patient support groups, through our North East Last Night of the Proms. Because we are a voluntary organisation, every single penny that we raise is donated to charitable causes. "We are extremely grateful for all the support and generosity from people in the region." On Friday night, Father Christmas will arrive by boat to the magical setting and flick the switch on the tree to illuminate England’s darkest skies with the glittering fairy lights. Since 2004, Kielder Winter Wonderland has been delighting children and their parents alike, where the event was on a much smaller scale and had just over 3,500 visitors. Now it attracts more than 18,000 visitors to the area over a 15 day period and has been a sell-out every year. Children can explore a whole host of festive surprises and activities, from ice-skating in front of the glittering lake, to helping the Elves prepare gifts for the big day in the magical workshops. 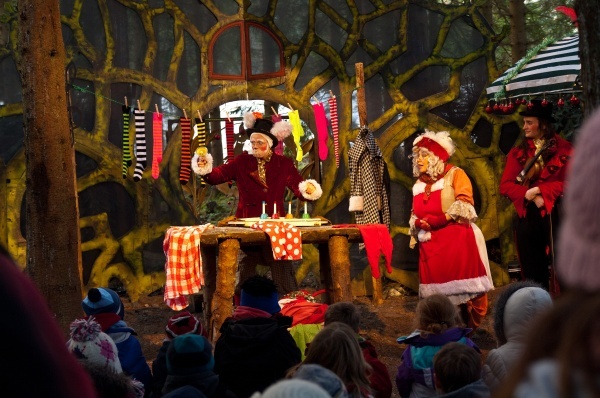 The day wouldn’t be complete without a trip to Father Christmas’ secret woodland home, through the enchanted forest with Mrs Christmas and her festive friends to guide the way. Kielder Winter Wonderland is open every weekend from Saturday 16 November until Sunday 22 December 2013 including Friday 20 December. Remaining dates available are Saturday 16 November, Sunday 17 November and Saturday 23 November at a cost of £32 per person. For children under the age of one the cost is £5. A booking fee of £4.50 also applies. Book tickets online at www.kielderwinterwonderland.com or by calling 0845 155 1553. Visitors must book in advance as tickets are not available on site.